The Southampton-York Natural Scenes (SYNS) dataset consists of image and 3D range data measured from a diverse set of ~100 rural and urban locations. Each sample comprises co-registered panoramic HDR image and LiDAR range data, as well as stereoscopic image pairs. The goal of the SYNS project is to provide high-quality range and image data for use in academia and industry. Access to the dataset is free - here you don’t pay for your SYNS. We do ask that you register with us. Adams, W.J., Elder, J.H., Graf, E.W., Leyland, J., Lugtigheid, A.J., Muryy, A. (2016). The Southampton-York Natural Scenes (SYNS) dataset: Statistics of surface attitude. Scientific Reports, 6, 35805. Outdoor sampling locations were determined from detailed map overlays of the scene categories of the UKLand dataset. 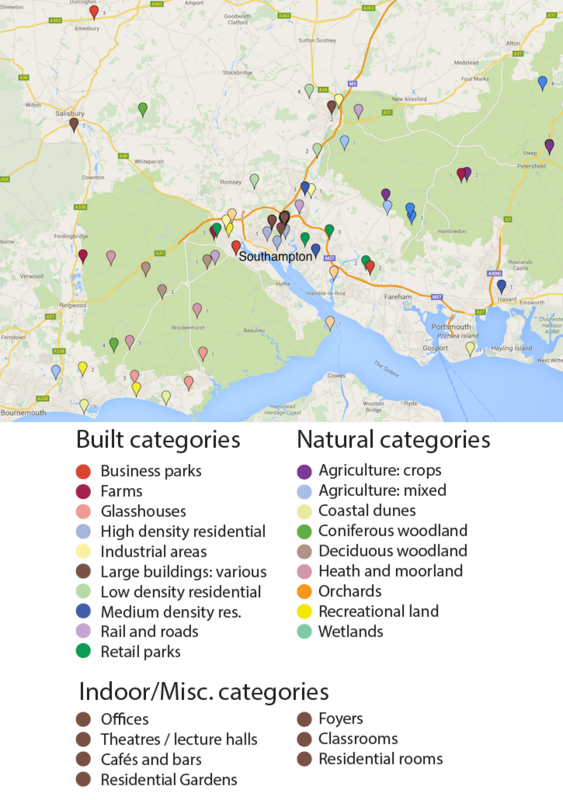 Our sampling area includes 19 distinct category types from this dataset; see 'Built' and 'Natural' categories in the map below. Within each category we selected locations to scan randomly and uniformly over geographic space. The dataset includes at least three unique locations for each category, as well as a repeat measurement for one of those locations, measured under different weather conditions or during a different season. Our indoor sampling locations were chosen opportunistically, and consist of rooms in buildings on the University of Southampton campus, as well as residences nearby. We have also included measurements taken in residential gardens. The SYNS dataset is an EPSRC (UK) funded collaboration between Professor Wendy Adams, Drs. Erich Graf and Julian Leyland at the University of Southampton (UK) and Professor James Elder at York University (Canada).